The Highways Agency has started a consultation on the proposal to introduce a 60mph speed limit for the M1 motorway in order to reduce air pollution levels, the government body said in a press release. The speed limit will be valid for a motorway section spanning 32-miles, from junction 28 near Matlock in Derbyshire to 35a at Rotherham in South Yorkshire. If approved, the limit could be enforced for several years, though the agency could not specify the exact time period the limit would need to be enforced. The move follows measures to comply with rules related to air pollution which were set by the European Union. The Highways Agency says that the speed limit might be the only way to reduce congestion levels and meet the targets for this built-up area. 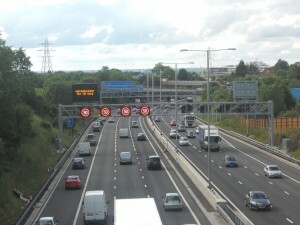 Air quality could be affected even further if the motorway continues to operate at the current 70mph speed limit, environmental assessments in the area showed. The agency said that the speed limit could be implemented from 7:00 to 19:00 seven days a week, but the proposal is open to changes and the 60mph limit could be only valid during peak hours or only applicable on weekdays when the traffic is heavy. The proposed restrictions on speed come on the heels of a coalition proposal to increase the speed limit to 80mph on motorways less than two years ago, which was dropped due to concerns over safety. The Campaign for Better Transport welcomed the proposal, with its spokeswoman saying it would improve road safety and traffic flow.